This best-selling ‘take-home-and-read’ full-colour information booklet is presented in a lively, magazine style. For use one-per-student as a ready printed booklet or as a PDF for in-house printing. It supports the delivery of careers education, advice and guidance with up-to-date, impartial information about the range of education and training options Key Stage 4. It includes information on the new grading system for GCSEs from September 2017, along with details of other reforms to qualifications and assessment. 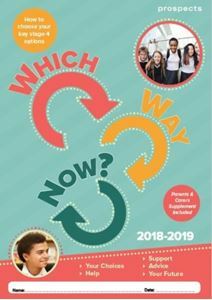 There are also case studies from others who have experienced this process, action points to take students through the steps they need to follow, tips and signposts for where to find out more. Each booklet contains a ‘Parents and Carers Supplement’ that will support parents and carers as they help their children with their subject and career choices. A Practitioner's Guide accompanies this resource.